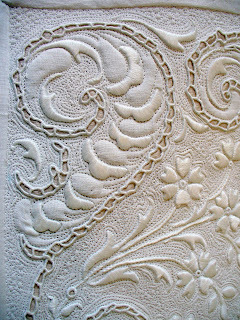 I've been on a roll this week prepping for my 5-day teaching engagement at Quilting Adventures in New Braunfels, TX. There are always soooo many fine little details that need to be pulled together and then I have to try and fit everything in those suitcases! 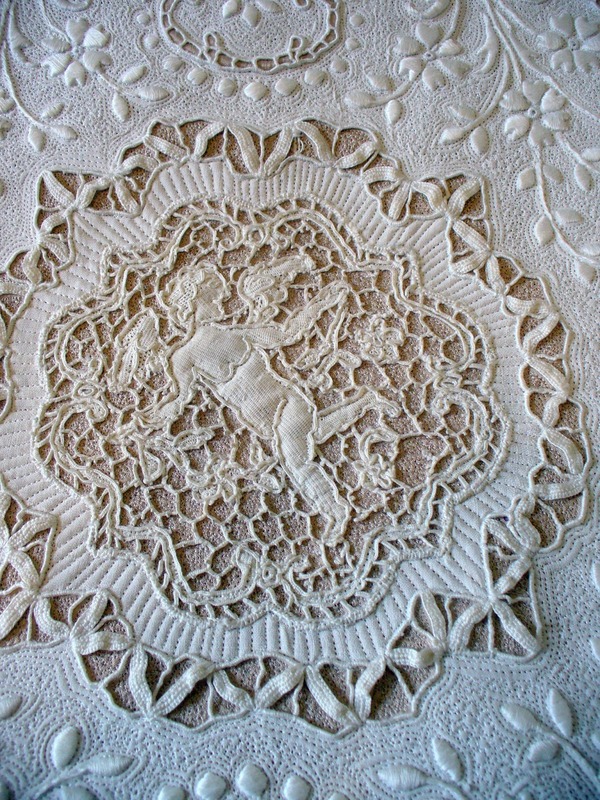 Part of the "roll" I've been on this week is working on my little Cupid piece. Once I found it I just had to get it done...it's also the perfect size to work on in an airplane and it has an insane amount of beading. 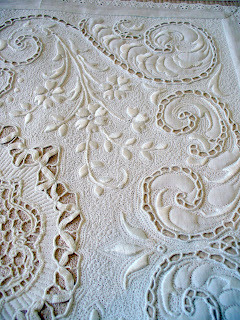 Part of the "charm factor" of this piece was the very raggedy edges which were fraying badly. 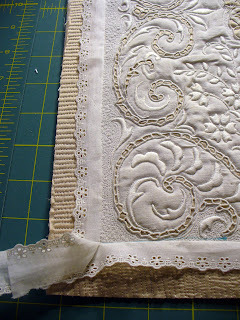 The more I quilted the worse it got so I made the decision to do the lace edging and binding first to stop the bleed. 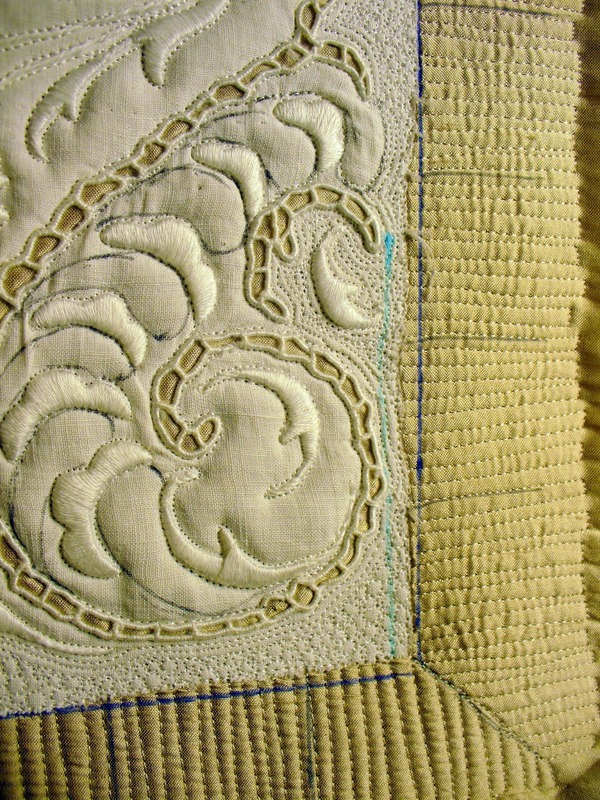 I quilted down the edges to stabilize them. 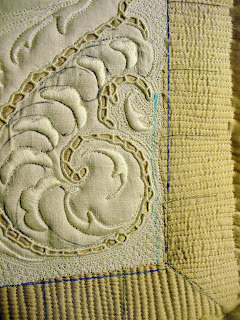 I quilted down the silk that runs underneath this piece with repetitive straight lines and then used my square to "square it up"...well that certainly wasn't going to happen. The edges were a mess. 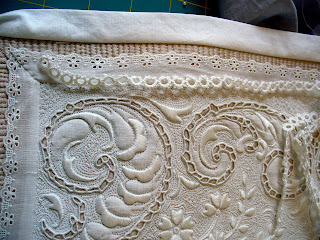 I found some old swiss lace yardage and it seemed perfect to finish the edge of the linen. 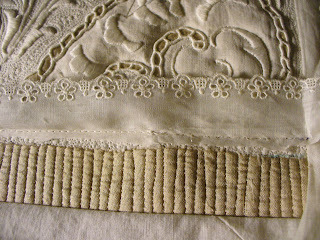 I sewed this down, mitered the edges and it looked better, but it still wasn't right. 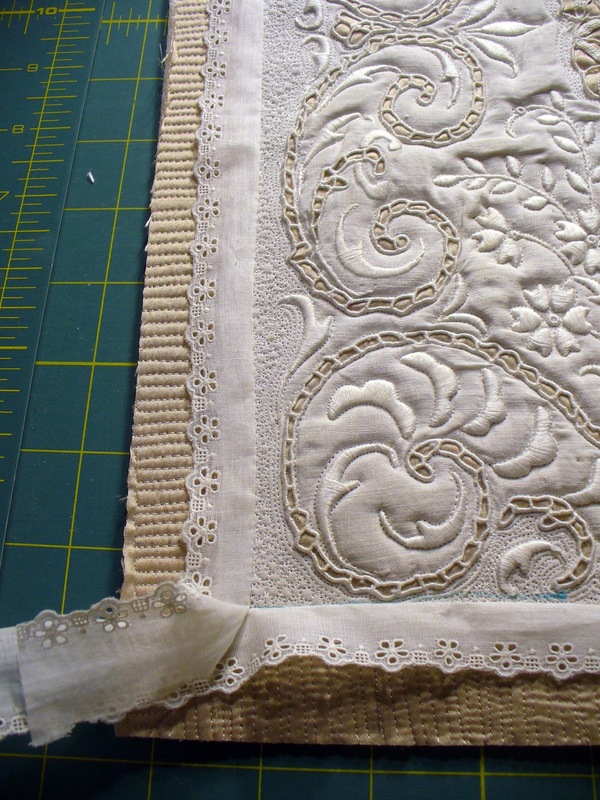 The swiss lace is very thin and you could see the seam shadow underneath and it was uneven and not pretty. 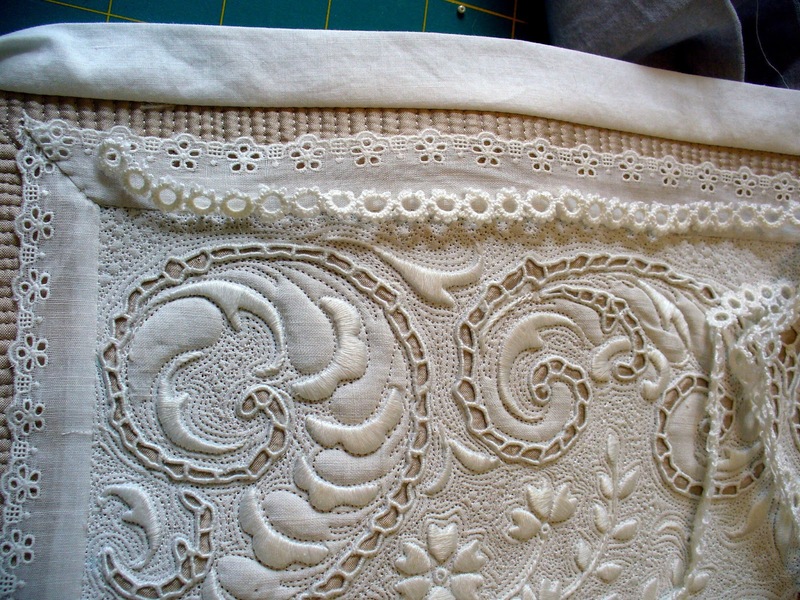 I found some tatting and am going to run this right along the edge of this seam. 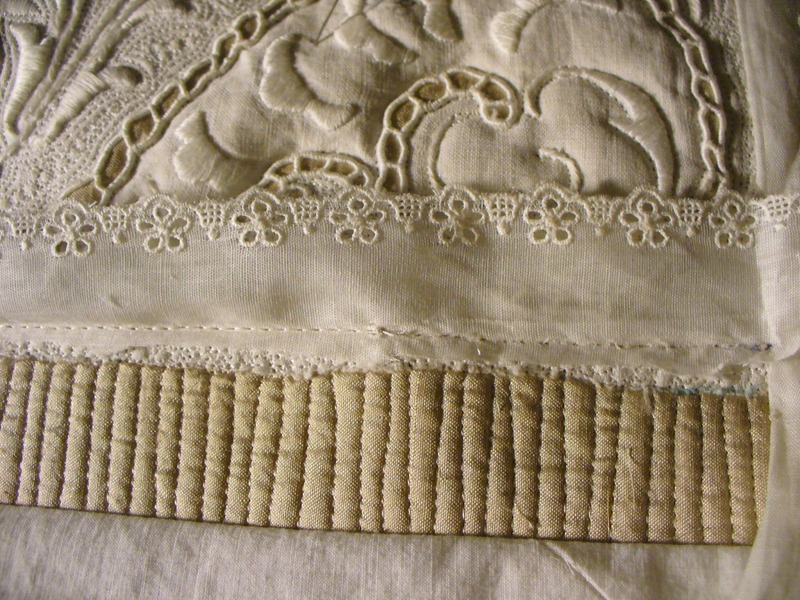 This provides a pretty buffer between the linen and the lace and hides the shadowing underneath.The final binding on the edge was created from a cutter linen that matched the linen perfectly. 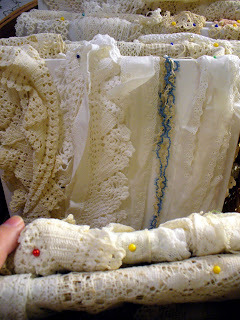 Oh...I thought you might enjoy seeing how I organize my lace. After too many years of having everything piled up in a basket, I decided to wrap my yardage lengths on foam core boards and they fit perfectly in my oversized basket. Now when I need lace I can quickly flip through the cards and see what I have! 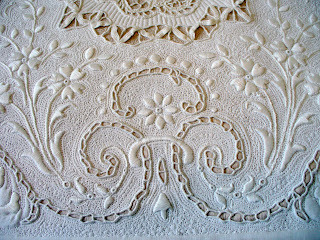 Here are some pretty details of the piece itself. I'm very pleased with how it has come out and am anxious to start adding some beads. I will be taking pictures when I'm in Texas and will hopefully have some great pictures to share with you when I get home. Oh I'd love a date with Cupid! He's going to be beautiful and I can't wait to see all the beads. 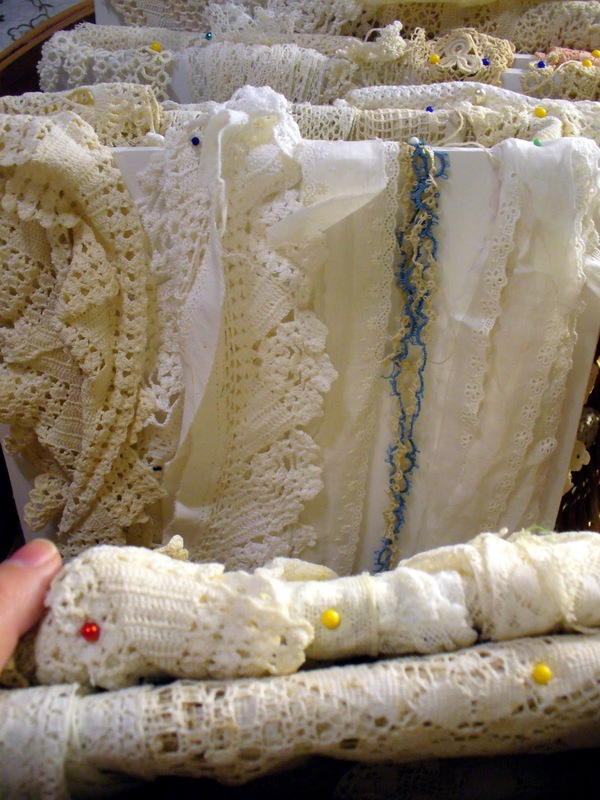 And by the way you really have an obscene amount of lace - I'm totally jealous. I would just have to periodically go by and pet it. 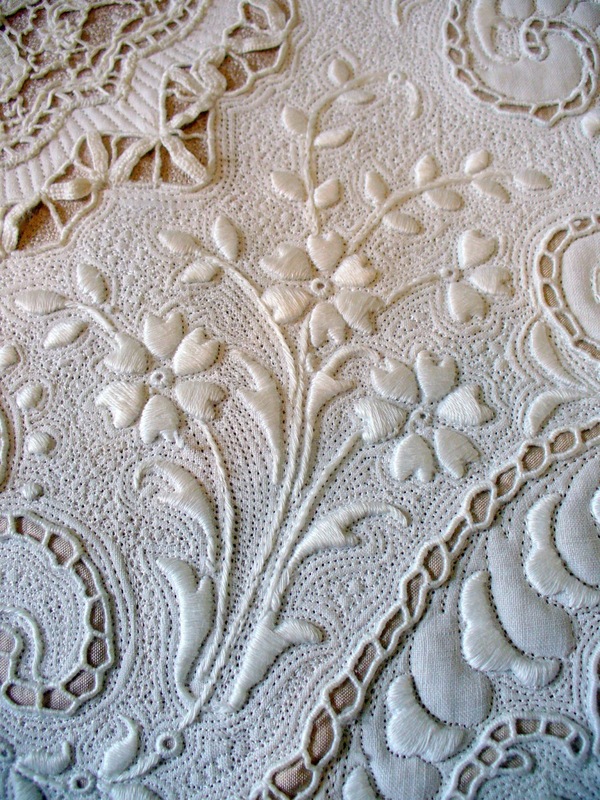 I am doing your craftsy class & loving it great tips. I have told friends about this class too. Beautiful work, as always! I too am taking your Craftsy class, and it's SO helpful. 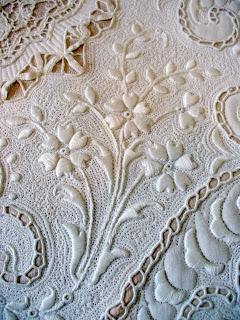 I'm thinking of taking your Open Threadbar class at VQF this summer, and I know Janome machines will be provided for your classes. 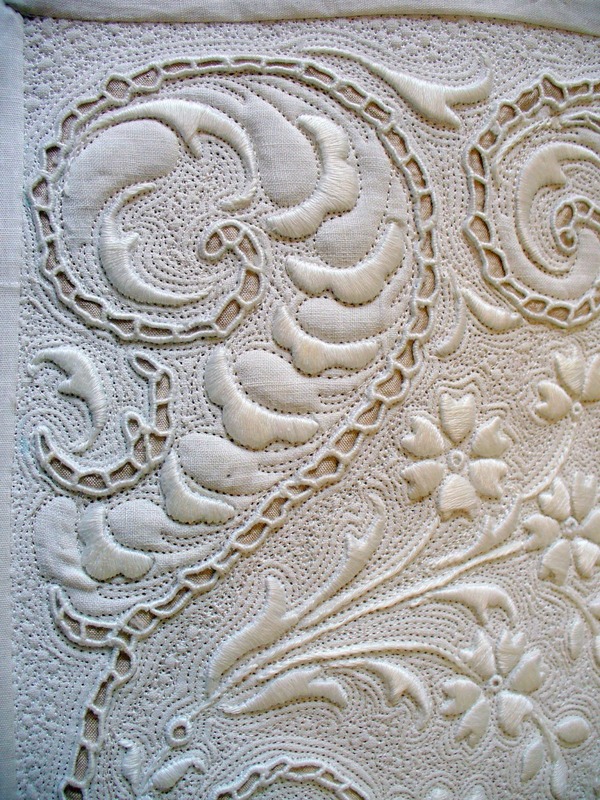 I would prefer to bring my own machine (Bernina) to learn how threads will work on it when I am back at home. Valid concern? You're sooooo dang GOOD!!!! Beautiful, beautiful. 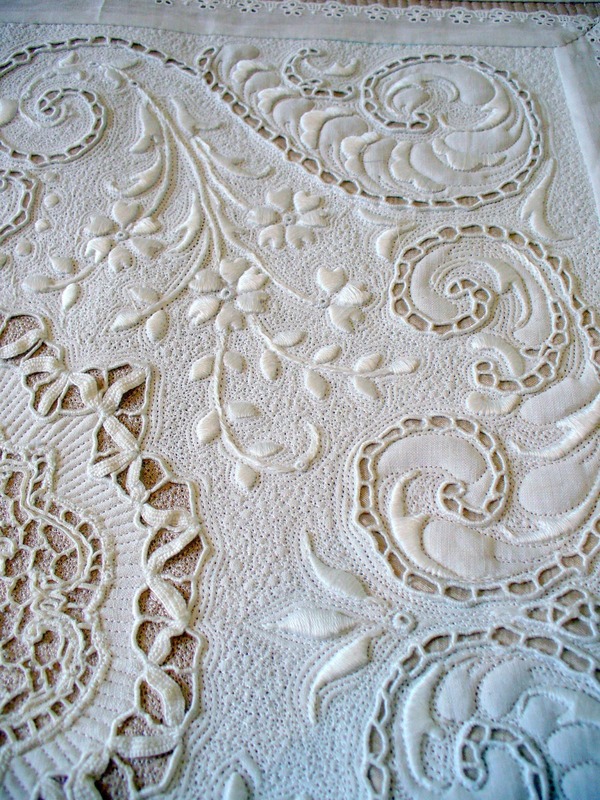 What a great solution and the quilt is just stunning! 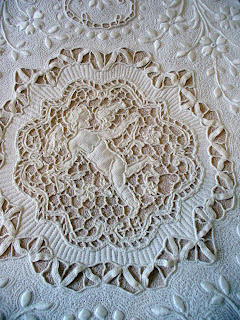 Cindy I'm taking your class at craftys and I must say, I can't stop looking at your work. BEAUTIFUL, STUNNING!!!! 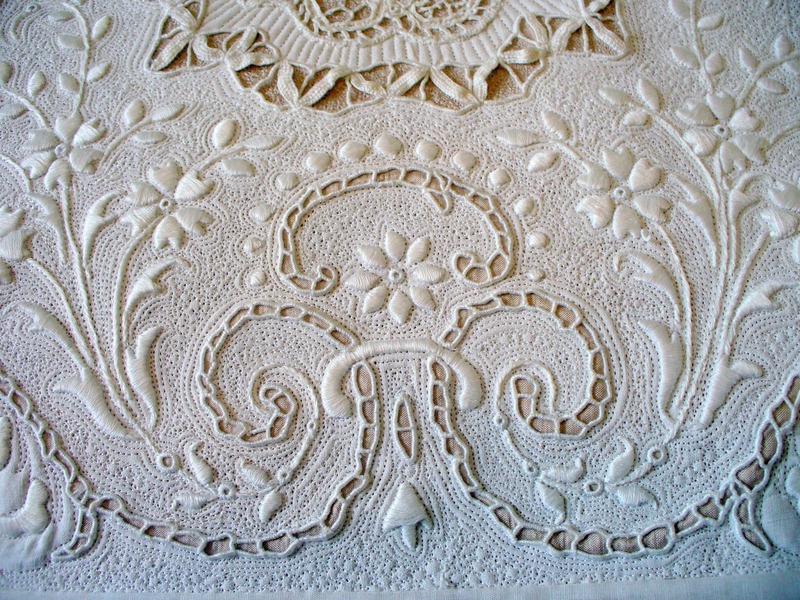 Thank you so very much for your blog and sharing your beautiful work and talent.